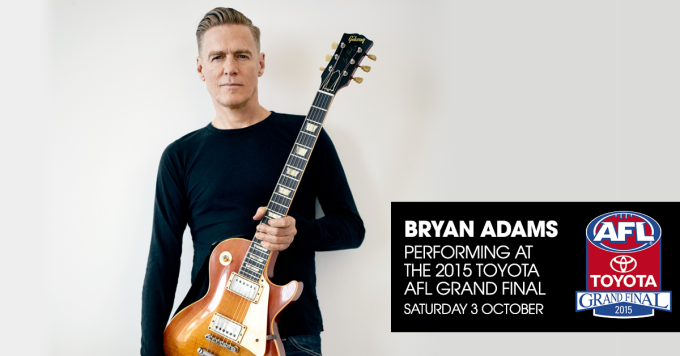 Canadian superstar Bryan Adams and British pop starlet Ellie Goulding have today been confirmed as the all-important entertainment acts for this year’s AFL Grand Final. To be held on Saturday October 03 at the MGC, the pre-game show will no doubt feature hits from both of the stars and looks set to appeal to a number of different demographics. “Australian music fans are amazing and being at the AFL Grand Final with sports fans will be an event to remember… I’m pleased to be a part of it,” Bryan said in a statement. “I love coming to Australia and am excited to be able to be a small part in one of Australia’s greatest days in sport,” added Ellie. The duo will not only play pre-game, but will also perform after the main game, with the MCG throwing its doors open to the public for a free post-game concert for the very first time. Chris Isaak, about to appear in the upcoming season of ‘The X Factor’ will also perform prior to the Grand Final, which kicks off at the MCG on Saturday October 03.